Hello everyone! I would like to thank our sponsor Kettle Cuisine for sponsor the soup review and giveaway here on the Shakin and Bakin Foodie Blog. The giveaway closed late last night so we do have a confirmed winner to announce today. Congrats Barbara! I just sent you an email so that you can claim your prize. 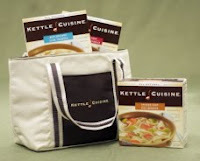 You will absolutely love these gourmet soups! Thanks for entering!